No one saw Tuesday's semi-final result coming. Many predicted Brazil would struggle without Neymar and Thiago Silva, but few could have anticipated a German side with three goals in two knockout games suddenly putting seven past the hosts. It is little surprise, therefore, that Jogi Löw's team are favorites for the final against Argentina. The Germans are -154 with Intertops.eu to lift the trophy after Sunday's final, with Alejandro Sabella's Argentina - who snuck past the Netherlands on penalties - available at +120 (all odds are subject to change). Colombian star James Rodriguez currently leads the race for the Golden Boot with six goals, but Colombia were eliminated in the quarter-finals, so Germany's Thomas Müller can overtake the Monaco player with two goals in the final. Rodriguez is the -200 favorite for the Golden Boot, with Müller (+200) his only realistic challenger. 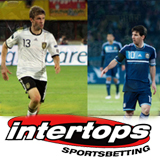 If you make a deposit with Intertops before the final, you will automatically receive a 20% bonus up to $100. And what's more, any pre-match bet on the final of $10 or more will be matched in the form of a free live bet (the maximum free bet awarded is $50).